The second album from this cult Russian black metal act. A journey back to early black metal where there was a meaning. Raw, filled with lot feeling giving the atmospere black metal needs. Recorded back to 1997. The atmosphere of the haunted woods, the ghosts of the past inspires FOREST. The result can be characterized as the Norse-styled black metal, combining the rawest aggression, the great DarkThrone-ish melodism and the splendid unique atmosphere. FOREST was born in 1994 as a project of Kaldrad (BRANIKALD) and Dagorath, the leader of another horde from Blaze Birth Hall called RUNDAGOR (long time dead now). The concept of the FOREST was born after Kaldrad's and Dagorath's journey into the old woods where the long forgotten sacrificial places \ forest temples and burial mounds of ancient Slaws were situated. The unique atmosphere of these haunted woods, the ghosts of the past channeled the inspiration into the hearts and minds of FOREST creators and right after the return from this journey, in the Autumn of 1994 the debut reh. demo of FOREST was composed and recorded in intuitive \ \ spontaneous way. It has very strange sound and 2 of 4 songs were not Black Metal, but some weird folkish ambiental compositions on guitars. It was recorded only for close comrades / allies and never widely spread, although one track from this rehearsal, called "Winter Howl" is included to their later demo '96 "Forest" in original version, another song from '94, called "Like a Shade Upon This Land" is also included to FOREST "Forest", but in re-recoded form (1996). 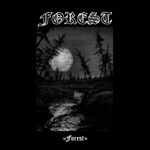 Up from those days, FOREST could be characterized as the Norse-styled black metal, combining the rawest aggression, great DarkThrone-ish melodism, Isengard-like clean vocals and splendid unique atmosphere. After the rehearsal tape '94 and "Forest" album '96, another album "Like a Blaze above the Ashes" '97 was recorded in the same line-up, and on the next work "Foredooming the Hope to Eternity" '98 Ulv Gegner of RAVEN DARK joined FOREST project. Few months later Dagorath of RUNDAGOR (RIP) left everything he was involved in past: all the radical \ ideological activities, BM scene and so on. Later, after the terror-campaign waged on Dagorath by two remained FOREST members and their allies, he was forced to escape from the town where he lived, and now his whereabouts are unknown, as well as no one knows if he is still alive or not at all.